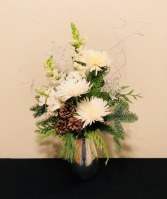 This white and silver arrangement features White Snapdragons, White Spider Mums and winter greens accented by silver ting, pinecones and white stars. Call the shop at (208)323-7738 to customize your order! This Victorian Styled arrangement features a wooden grain urn with winter greenery, accented by birch branch and baby eucalyptus. It showcases burgundy leucodendron and white statice with a touch of golden lotus pods and gold seeded eucalyptus. Call the shop at (208)323-7738 to customize your order! 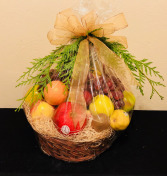 **This arrangement contains seasonal items that may not be available at time of purchase, please call the shop for details. 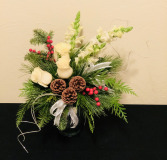 This natural winter arrangement features winter greenery with white roses and white snapdragons; accented by silver ting, pine cones, white ribbon and red faux berries. 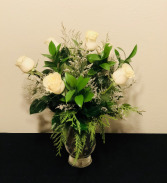 This Half Dozen Rose Arrangement features six white roses, winter greenery and ruscus, accented by white limonium filler. Call the shop at (208)323-7738 to customize your order! 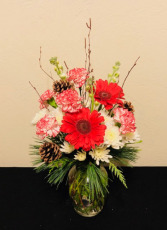 This bright mix of Peppermint Carnations, Red Gerbera Daisies, White Mums, and White stock are accented by Birch branch and pine cones. Call (208)323-7738 to customize your order! **this arrangement contains seasonal items that may not be available outside of the Winter season. Please call for details! Thank you! This customizable round centerpiece, shown at $50, includes 2 (two) 12" Taper candles in burgundy, orange or silver, assorted longer lasting flowers, such as statice, mums, or alstroemeria, and accents of either natural elements such as pine cones, branches or holiday balls and ribbon. We can also do a combination to match your style! 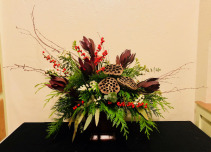 The next price points of $60 and $70, we add in some showy flowers, such as roses, lilies, or other larger flowers. Call the shop at (208)323-7738 to customize your order and inquire about pricing differences. **This arrangement features seasonal flowers that may not be available at time of purchase. We will always substitute with similar products when needed. Call the shop for details.